Bali is usually on NomadList‘s first place as one of the best places to live and work remotely, and specifically, Canggu is a special place within Bali where digital nomads and Indonesian locals mingle. In fact, in Canggu there is no harassment to tourists or foreigners as it happens in other areas of the island, such as Ubud. There is a perfect integration between locals and foreign, who stay for periods longer than a simple vacation. 1. 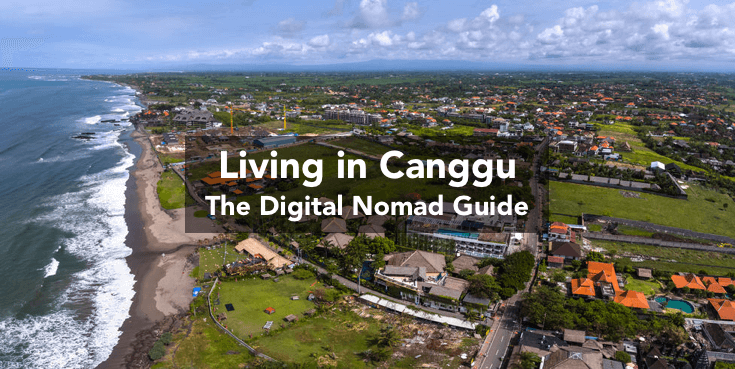 What’s so great about Canggu for digital nomads? Weather: The weather is one of the decisive factors for digital nomads who wish to live outside with no winter and travel with a small backpack. Bali has a good weather all year round, around 30º Celsius throughout the year. But it is a tropical monsoon climate, which means there is a rainy season that lasts from November to April. In these months, good weather mixes with tropical storms. The rainy season marks the low season, so these are months when prices are lower and the island is less crowded. There are more mosquitoes during the rainy season, so you will need to have repellent always at hand, especially at sunset, when there are more. In fact, you can request it in many establishments as they usually have it available for their clients. So if you have forgotten it and you are having dinner in a bar, do not worry, you can request some without any problem. Surfing: Within Bali, Canggu is the perfect area for those who enjoy the beach, and even more, those who want to mix work and surfing. Those who enjoy the beach and surfing will not hesitate in choosing Canggu among hundreds of Indonesian islands, and even more within Bali. Bali is the main tourist destination in Indonesia, and the life of its inhabitants is calm and safe. Its inhabitants are used to tourism and there is an environment of peace that turns any kind of stay on the island comfortable. And with such peace, violent acts do not happen. For women: it is one of the main destinations chosen by women travelling alone due to the safety they enjoy on the island. Theft: You just have to be careful in tourist places with your bag snatchers or purses being stolen. Although they are unusual, they can happen as in any other places in the world. Drugs: the purchase or consumption of drugs is punishable by imprisonment. They are very strict regarding drugs, something that is less common in Europe and that must be taken into account. The cost of living on the island is far below that of any country in Europe, Australia or North America, so there is an important foreign community from these countries spending some seasons in Bali. Renting a room in a villa with a pool costs around €300 per month (all expenses included), a meal in a warung costs around €4 and a beer, 1,5€. The Internet is very good in bars and coworking spaces, better than that of the houses, where it is not usually fast enough to work comfortably or have meetings. In Canggu, the traditional “Warung” or traditional Indonesian food houses mix very well with hundreds of “Western Style” cafes and restaurants, where you can eat pizza, hamburgers and lots of healthy and vegetarian food. In short, there is a wide range of offers for all tastes. It is necessary to point out that, in Bali, it is common to eat and dine outside the home. Few accommodations have a kitchen, and buying food and cooking at home it is more expensive than to eat outside. In addition to food, there are many places to practice yoga, have a massage and personal care establishments of all kinds of prices in Canggu. Therefore, it is usual among digital nomads to devote at least one day a week to the care of their bodies at very affordable prices. Some establishments where to have breakfast or lunch: Canteen and MyWarung Echo Beach or Little Flinders. There are also several Mexican places in the area, such as Sizzle Wraps Canggu, and many pizzerias, for example La Fabrica. Vaccines: It is not compulsory to get any vaccination if you travel to Bali, except if you are from South America or Africa. In that case, you will have to prove that you have been vaccinated against yellow fever. However, it is advisable to get vaccinated against Hepatitis and Typhus. Additionally, there are many stray dogs in Bali, so it may be advisable to get vaccinated against rabies. As you are going to travel to a tropical country, it is advisable that you visit your doctor before leaving for Bali to receive the appropriate recommendations. Travel insurance: It is highly recommended that you consider hiring a travel insurance in case you need a doctor. In Canggu, there is a health center where they speak English and there is also a hospital nearby, in the way towards Kuta. If you have insurance, you can recover all expenses, depending on your insurance, but keep in mind that all health services for foreigners are quite expensive.Here you can also see some travel insurance options for digital nomads: Top International Health Insurance Options for Digital Nomads. Recommendations to avoid health problems: It is necessary to be careful, particularly with water. Drink only bottled water; avoid ice and fresh food that you do not know how it was washed. Even so, if you have stomach ache, you should stay hydrated and go to a pharmacy. If you are still not feeling well after a couple of days, go to the emergency room and/or call your health insurance. Pharmacies, even though they offer fewer medicines than in Europe, do have the basics and can offer you valid advice.Even if you are careful, it is common to suffer a stomach ache. There is even a name for an ailment of this type in Bali, “Bali Belli”. It consists of several days with diarrhea and severe stomach ache. It usually lasts a couple of days, but if you still feel it after a couple of days, you will need to go to a pharmacy, and if it persists, you should visit to the Health Center. Transportation on the island is completely chaotic and it takes much longer than we would think. The traffic is very slow, and it is even worse if you take a taxi, as it is possible to spend minutes standing still in traffic jams full of motorcycles and all kinds of vehicles. Therefore, if you need to go somewhere at a specific time, go with a lot of time to avoid surprises. Taxis: There is no public transport, but there are many moto-taxies and taxies. The cost of these services is very low, so you can use them almost daily. 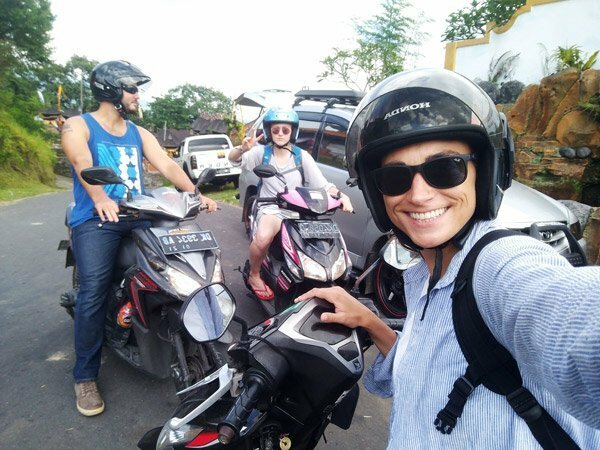 Once you get to Bali, it is very useful to download a few apps to request a taxi, such as GoJek and Grab (moto-taxi) and BlueBird (for taxi cars). There are also drivers with cars acting as a private taxi. The blues are “official” and more serious, and you can request they to use the meter. Although, due to the serious traffic problem, it may be better to settle the price before starting the trip (this is how GoJek or Grab work). Motorcycle: In the island of Bali, it is very usual to rent a motorbike to go anywhere. To rent your motorcycle, you should not hesitate to ask the owner of the place at which you are staying. He can get you a better price. If you have never ridden a motorcycle, there are Indonesians who give lessons to drive a scooter in English. Virtually all Indonesians who own a business speak English. Almost anyone in the Canggu area, some only know a few words, but you will be able to understand anyone. This makes living here easier as long as you can also speak it. What they do appreciate is that you use some word from their language. They think it is funny and they are very grateful. There are Balinese classes for foreigners in coworking spaces. It is not necessary to obtain a visa early if you are going to Indonesia as a tourist. You will be authorized to stay for 30 days after your arrival. Afterwards, you can extend it to a maximum of 60 days, and you will have to pay a fee then. It is best to check the Indonesian embassy website for your country. Here, you can see how to get a visa if you are Spanish. It is very usual that those who want to stay in Indonesia more than 60 days take a weekend trip to another country, for example to Kuala Lumpur, Malaysia or Singapore, and return and repeat the operation. In that way, you will get another 60 days to stay. 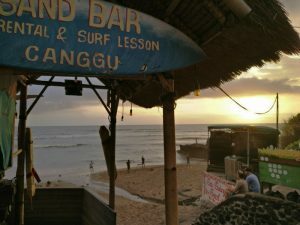 Many digital nomads who live in Canggu for a season usually go out, dance or have a beer after work. Therefore, there are several places to do this. Everyone who lives in Canggu has at least once visited one of the classic places in the area. At Old Mans, there is music or a DJ every day and people dancing. You can have dinner and a drink afterwards. There is Deus Temple where, in addition to concerts, they have a night where you can get a free tattoo. And at PrettyPoison, you can see skaters performing amazing tricks while you have a beer. Other more chic and charming places are La Brisa, in Echo Beach, or Finns Club, in PantaiBerawa. You will be able to find Instagram and professionals models taking photos in the corners of both of these places. 2. Where to live in Canggu? Bali Housing and Acommodation – Group where you can find villas or rooms in shared houses. Bali Seminyak&Canggu housing & accommodation. Dojo Bali– It is the coworking space located in this area, where you can meet people looking for roommates. Additionally, it opened a coliving space in the year 2018. Other digital nomads, for whom it is not essential to be near the coast or those who are yoga lovers, choose Ubud as a base. It is another ideal place. It is in the interior of the island, between infinite fields of rice. Without a doubt, even if you do not live there, it is a place you must visit. Here you can find the Hubud coworking space or the coliving space Roam. In this area, the main city is Sanur, where there are some coworking spaces such as LivitHub, and it has better waves from November, which is when the rainy season arrives in Canggu. Bali is a usual destination for the trips organized by groups such as WiFiTribe, RemoteYear, etc. Therefore, it can also be an option to travel directly with them. Here you will find a summary with the Top Events for digital nomads in 2018, where you will see who is planning a trip to Bali this year. 3. Where to work in Canggu? It is more than a coworking space. It is the place where you will have the best internet on the island and, if you travel alone, where you will probably find everything you need. You can meet people, attend free events, interact with others, have breakfast, eat and everything you can imagine. They do not have fixed stations to work, but there are different environments, room with air conditioning, outdoor areas with fans and a second much quieter floor. Additionally, they have poufs where you can sit around the pool. Crate Cafe: It has large shared tables and incredible views. It does not have plugs, but you can work while they serve your food. MachineryCafe: As in almost every place in Bali, the waiters and owner are charming. It has air conditioning and is very quiet, with good music, plugs and bathroom. GypsyKitchen& Bar: It has air conditioning, good tables and the Internet is acceptable. It is a nice place from which to work. Canggu is full of coffee shops visited by online workers, so you can discover which one you like the most with a simple walk. The Internet connection from the houses or villas is usually a bit poor to work, but you can always check it during your first days at the location. There are many villas shared by remote workers that manage to have a router and stable connection. It can be a question to consider when looking for a home. And as it is possible anywhere else, you can share WiFi (tethering) using your mobile phone. This option works really well and will almost always work better than the network offer in some accommodations. How to get your local SIM card: You can buy a SIM card at the airport when you arrive. Although this will be more expensive (but they are really cheap), you have internet from the very first moment on the island. Or you can buy a card at some kiosks. There are hundreds of them. To choose one you must consider that all of them are prepaid and you will not need to sign any contract. But you must take into account the duration of the card –some last only 30 days or less-, how many GB it will allow you to use (especially if you intend to use the internet to work, you will have to choose larger amounts), and finally, you will need to choose one that allows you to recharge it, so you will not have to change your local number each time you spent your mobile data. Temkolsel is the provider with the best coverage. You can choose the one that best suits you according to the duration of your stay, but having a local card is a must without a doubt. Keep in mind that to use the taxi apps, you will need a local number. Also, you can check other ways to access the internet globally in our post Top Mobile Hotspotsfor Digital Nomads. 4. Where to network with other digital nomads in Canggu? Whether you travel alone or with others, you will realize how easy it is to meet people who work remotely like you in Canggu from the very first moment. Besides tourists, there are countless online workers who choose this place in Bali, so it is quite easy to meet people. Whether you live in a room within a villa or you visit a coworking space, you will meet people in the same situation as you, but you can also join the following Facebook groups. They are very active, offer information about Bali, and they also organize meetings, weekend trips, etc. on the island. 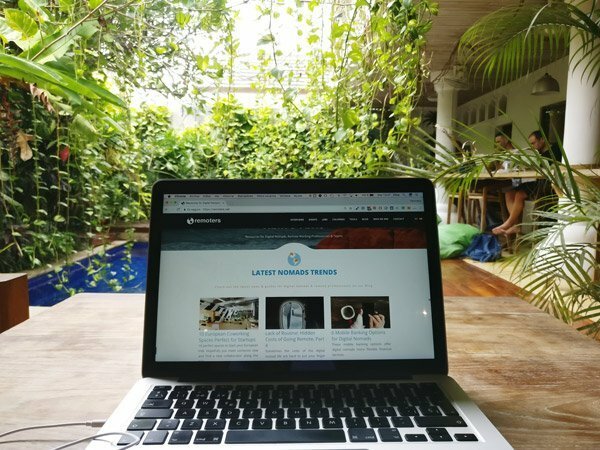 TL;DR: Which type of Digital Nomad is Canggu for? All those who look for a place to surf in addition to a good Internet access. Bali is for surfing. Those who enjoy good weather, do not mind extreme heat, and travel only in flip flops. Those who want to interact with young and inspiring people who are full of ideas they carry out. All those who, besides working, like to go out and dance one day per There is a party every day, if that is also something you are looking for. People who do not mind having to take some extra care when considering their health in relation to living in a tropical country.